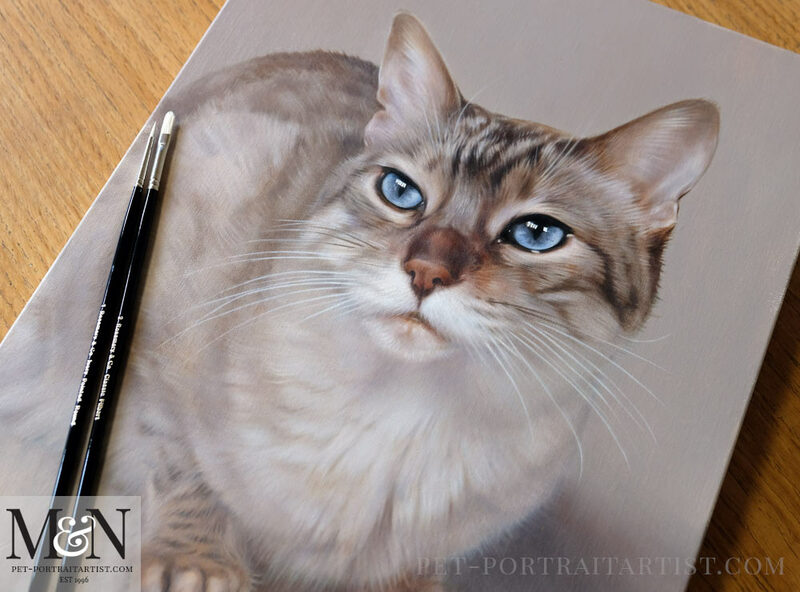 Welcome to Nicholas’ latest cat pet portraits in oils. This is an 18 x 14 inches oil painting completed by Nicholas on Italian Linen canvas commissioned as a surprise gift for Christmas. I think the recipient is going to be delighted! 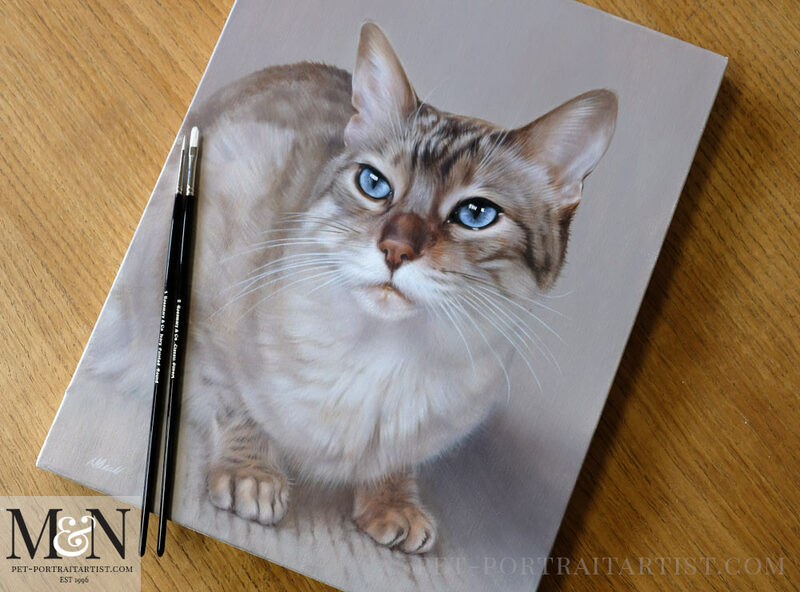 Client Barrie commissioned the oil painting as sadly Tia is no longer with us, so this oil painting will be a most beautiful Christmas gift for the recipient. I know that there will be a few tears shed. Our clients asked us to have the painting framed and ready to display so that they could wrap it up and keep it ready for the big day. 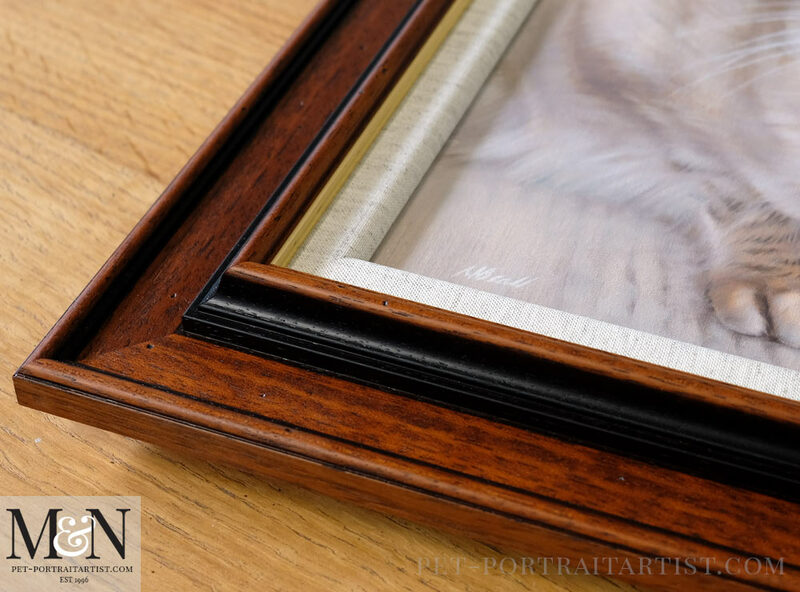 The portrait was framed in our Traditional Flat frame and has been a long time favourite of ours. The colours work so well with Tia, especially the slip. Scroll down the page to see photos. You can see a final scan and detail below too. Barrie and his wife Barbara visited our studio to collect the painting in person and it was really lovely to meet them. Barrie sent the email below when he saw the final scan. They were even more thrilled when they saw the portrait and said it was ‘Just like Tia’! The portrait captures the essential Tia to perfection. Nicholas, your work has not exceeded our expectations as our knowledge of your work has led to those expectations being very high in the first place. Thank you. 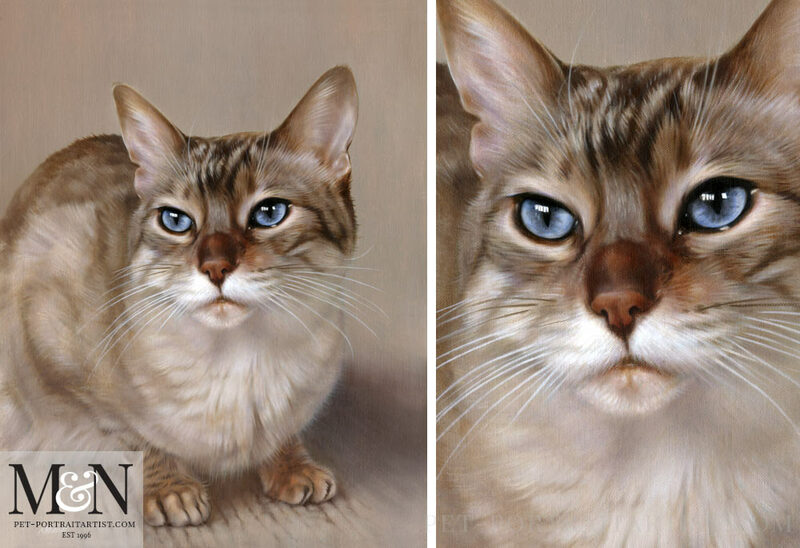 Change not a jot or tittle…..Claire will see, in the portrait, her Tia in all her wistful glory…..
Tia’s portrait was hand painted and as you can see from the photos below, Nicholas’ brush strokes are very fine. 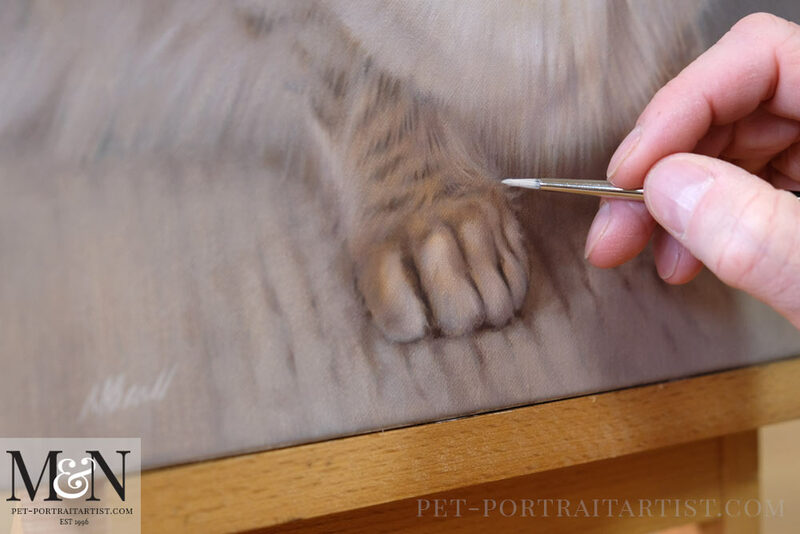 I took a few photos of the painting while he was adding the very final touches. 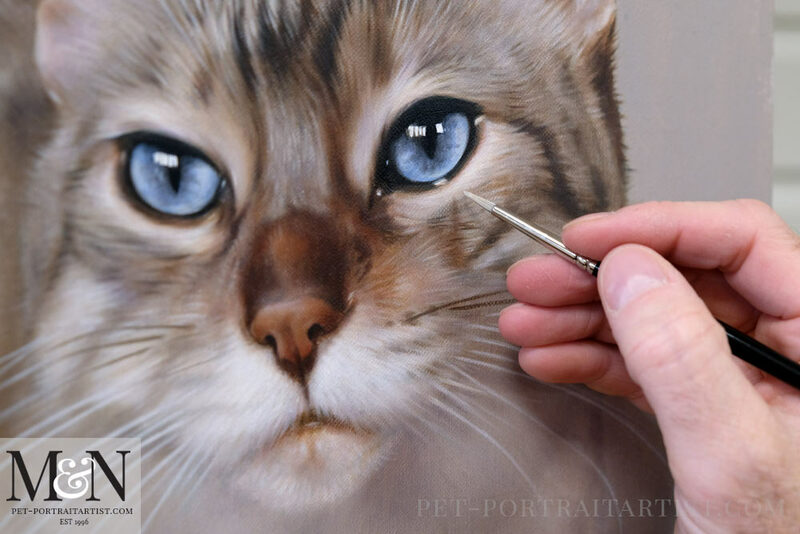 The camera has picked up the canvas and painting well, showing how beautiful the blacks are around Tia’s eyes. Nicholas paints using relatively small paint brushes to create his paintings. You can see a two of them on the painting below. These are brand new brushes, hence why they look so clean! 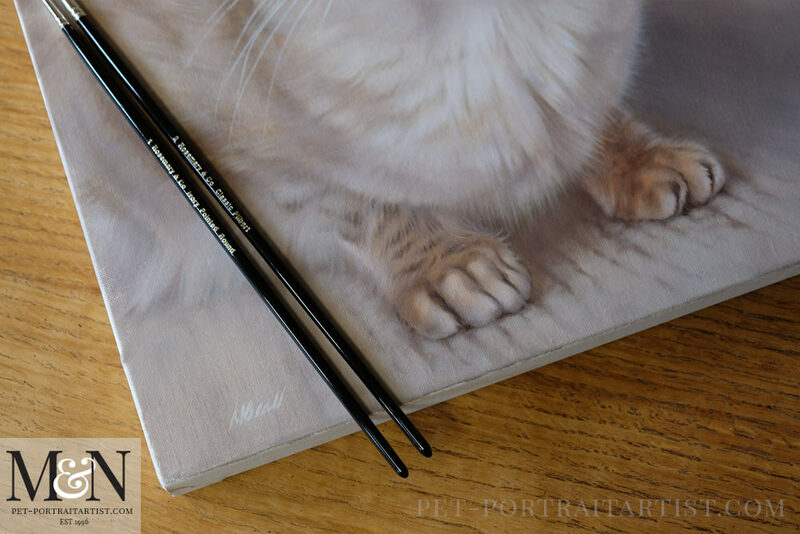 Nicholas loves to use Rosemaries brushes and pretty much soles uses them for his work now. They are fabulous quality. We hope you enjoy viewing the photos of Tia the cat. 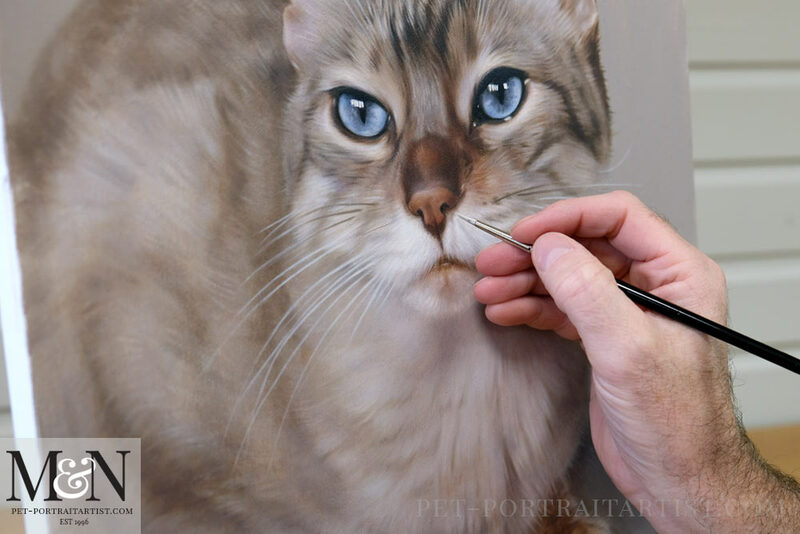 The oil painting was photographed here in our studio as soon as it was complete. 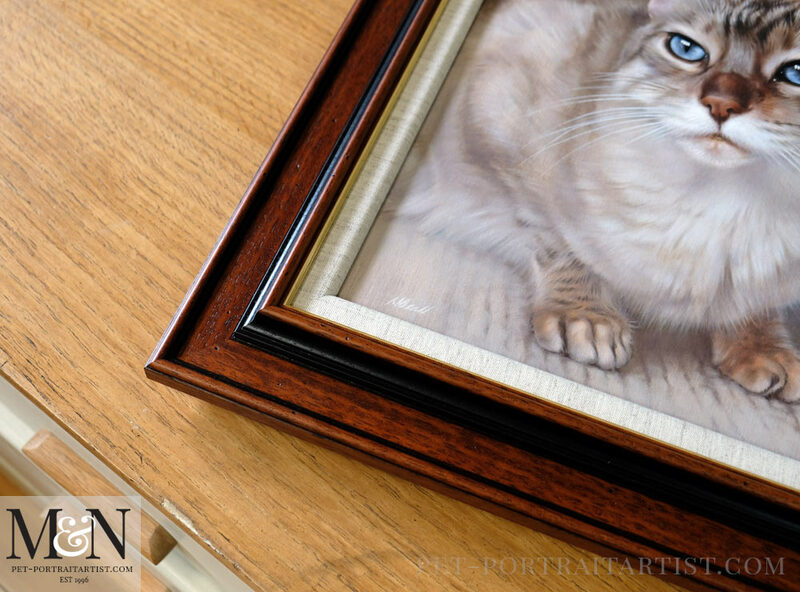 Our clients chose to have our framer Amanda frame the oil painting for them. 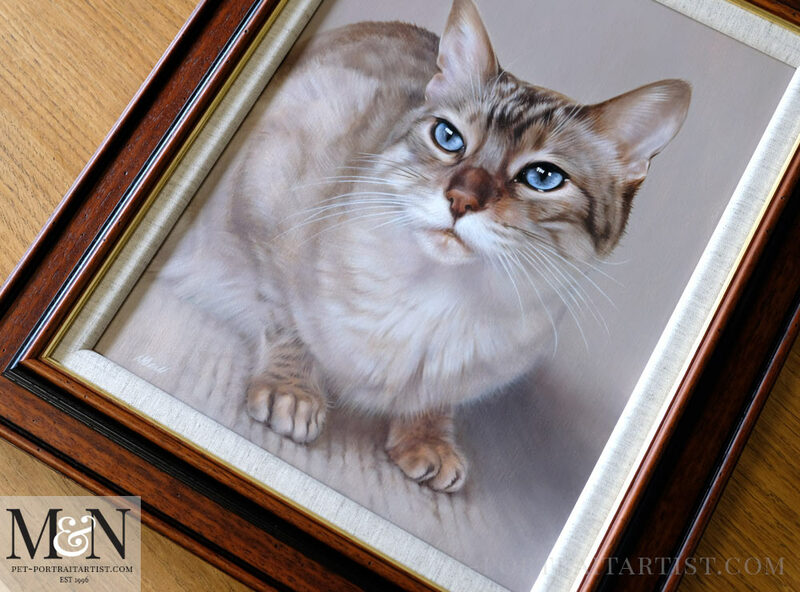 Barrie requested the Traditional Flat frame and we feel that the colours and tones work beautifully with Tia. 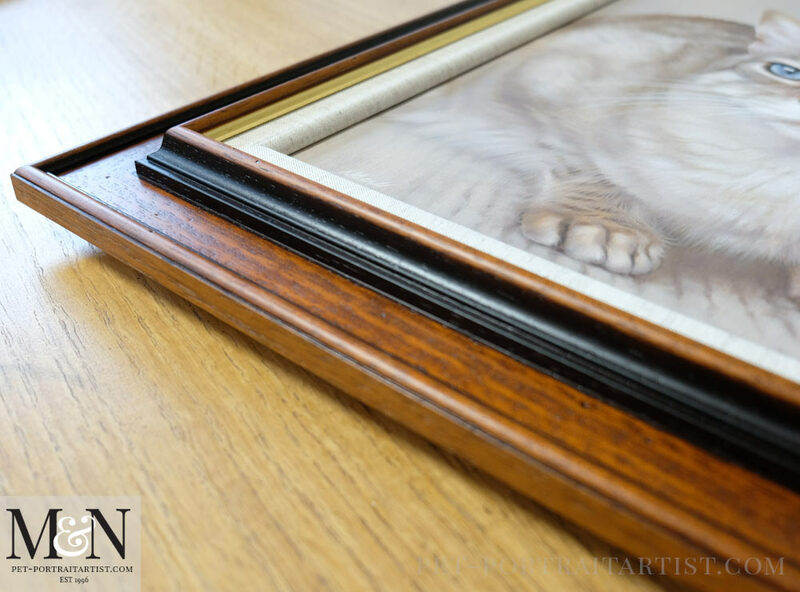 Initially choosing a frame from our website, Barry was concerned that the brown hues of the frame would be too dark. Every frame is slightly different, especially being a natural wood product. The tones of the moulding were actually slightly lighter and richer in tone than we have had previously – which was perfect! Doesn’t the linen slip work really well! 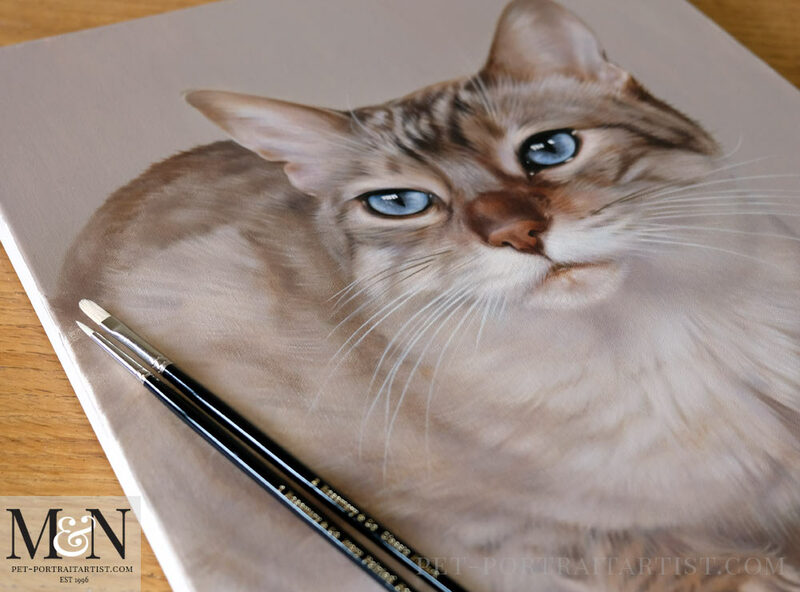 Your cat portraits are absolutely dazzling!